I just did a whole bunch of spring themed OSW cards based on an idea from Jessica at Craftin' and Stampin' which she based on a tutorial from Inkin' It Up With Jessica - two Jessicas, isn't that confusing! *smile* I took the basic cuts and modified them a little to fit on A2 cards instead of the larger cards they were originally designed for. I cut my double sided 12 X 12 paper from a We R Memory Keepers Simply Spring Kit according to the layout but when I started laying it down I trimmed where necessary to make it fit the A2 cards. I also added a few more layers to give the cards some extra personality. 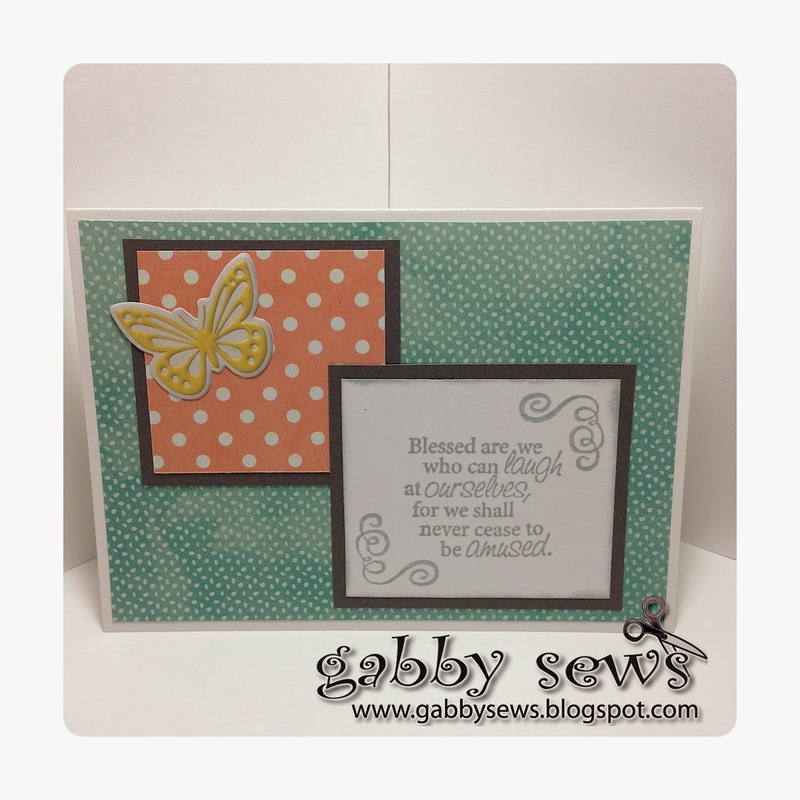 For this card I took one of the solid card stock cuts from Jessica's tutorial and used my Fiskars Daisy edge punch and then backed it with some of the same gray card stock I used for the mat on the sentiment. The sentiment is a clear stamp from Stampabilities that I picked up at Hobby Lobby just a couple months ago and I stamped it with Momento Dew Drop London Fog ink. I've been itching to use this stamp and I think it works great with this springy paper! I did have to cut the sentiment base larger than called for in Jessica's tutorial to fit this particular sentiment. 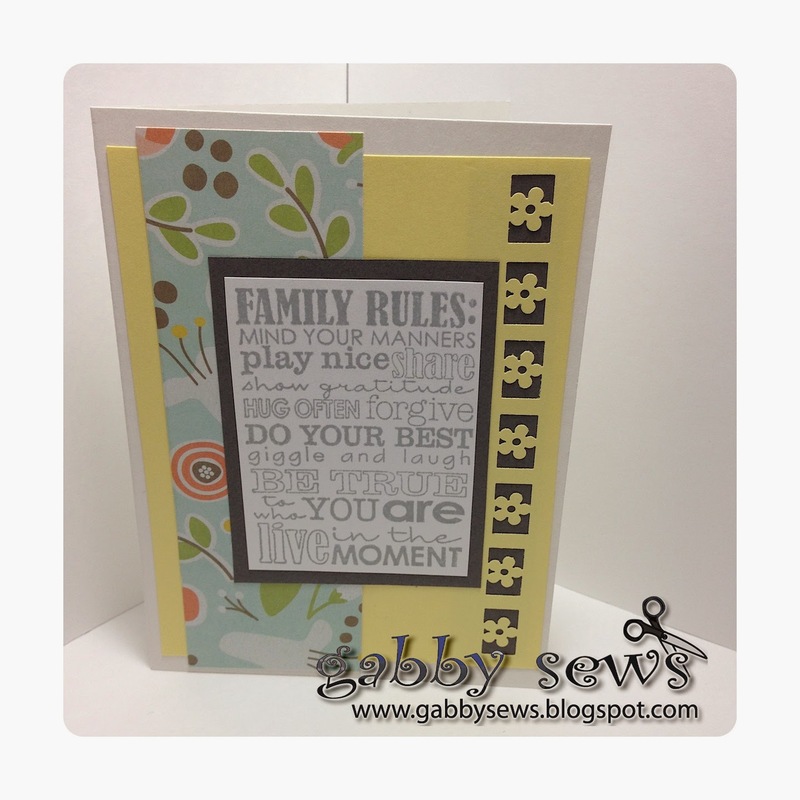 For this one I added some of the sticker embellishments that came in the Simply Spring kit at the top and the bottom. 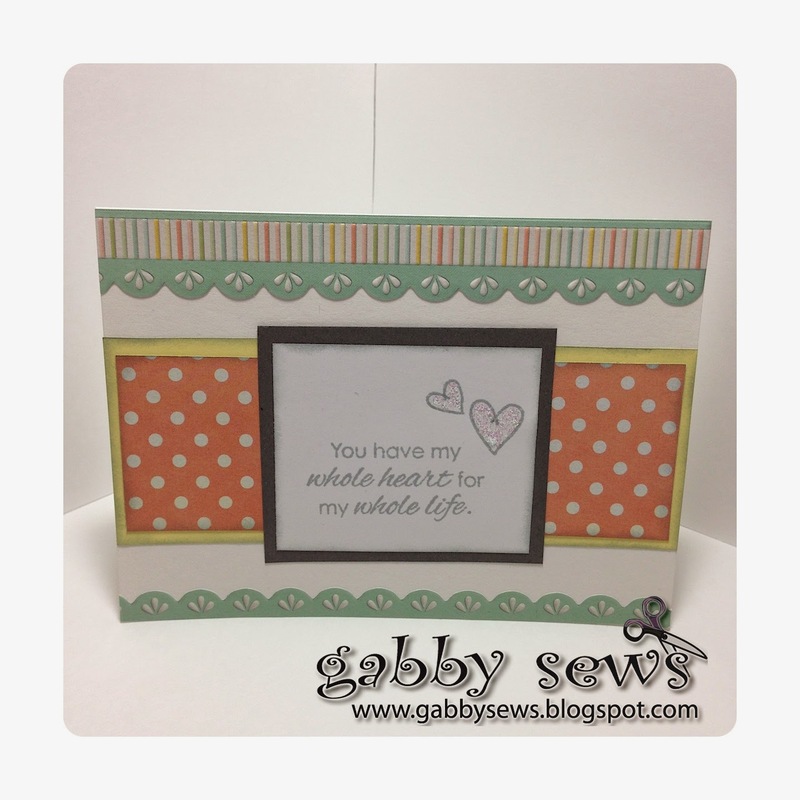 The sentiment is from the Fiskars Sweetheart Set. I inked it also in London Fog and added some Diamond Stickles to the hearts for a little extra dimension. I think this one turned out so cute. I love that little dog. I was tempted to add some Copic coloring to him but in the end I'm glad I left him alone. This was also inked with London Fog and I added a little drop of Diamond Stickles to the heart above the hello sentiment. The sentiment is from the Fiskars Sweetheart Set and the dog is from the We R Memory Keepers Furever Friends set. I think this one turned out cute. I toyed with fussy cutting out the tag (from the Fiskars Terrific Tags set) and then layering it on the card stock base but in the end I think it works just leaving it stamped directly on the base. I colored the little daisies with a touch of Copic YG00 and then put a small dot of Diamond Stickles in the middle of each flower. The brad is one I had in my stash from an unknown makers but it's really small and flat so mailing shouldn't be an issue with this card. The sentiment on this one is from the Fiskars Laugh With Me set. 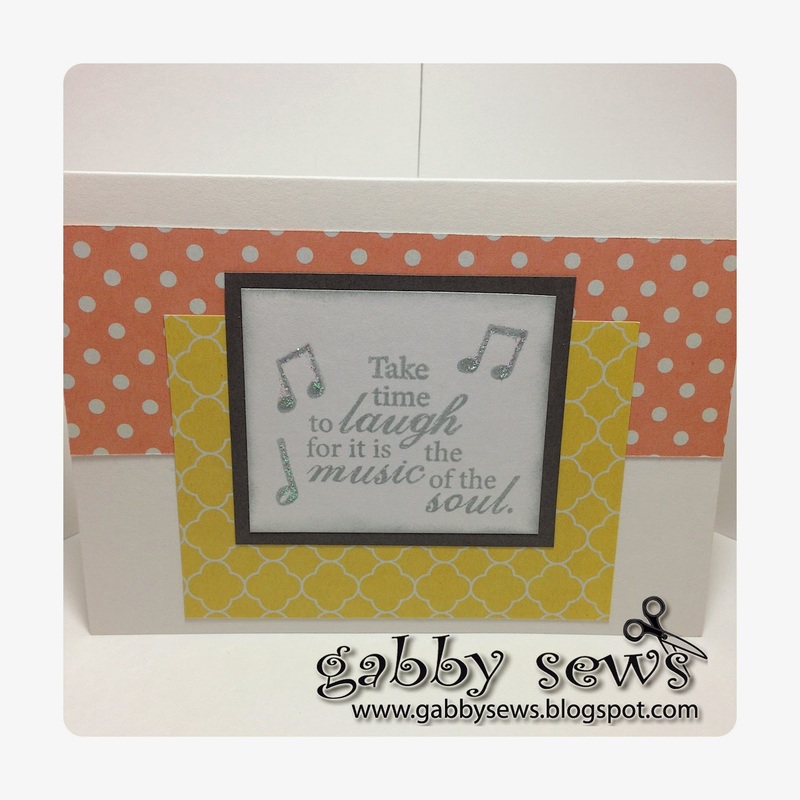 I stamped this one with London Fog and added Diamond Stickles to the music notes. It's really sparkly but unfortunately I just couldn't capture that with the camera. This card is using the same Laugh With Me set and I also added a sticker from the Simply Spring kit. My husband pushed me outside my comfort zone on this one and urged me to place the butterfly off center. I'm still not 100% positive about it but I'm growing to like it more. I love, love, love how this one turned out! It all started with the stamp set on this one. I've had this Dimensions Clear on Clear Thoughts of Fancy set for probably over 10 years. It was one of the first sets I bought when I started stamping. I stamped it in London Fog and then colored the dress with Copic E01. I really love how the Copic color is really close to the pattern paper color. I don't have a lot of Copics so matching things is not the easiest for me. Once I had the dress and sentiment done and layered on top of the pattern paper I realized it was missing something. I didn't have any paper in my stash that looked quite right so I found this flower border stamp in my stash by Anna Griffin from her Modern Graphics set and stamped several rows of the flowers creating a background directly on the card base. Unfortunately her Angel Policy does not allow sales of items created with her products to be sold on the Internet so I will be shopping for a different stamp to create the background for future reproductions of this card. I try not to use anything that I can't eventually sell on Etsy. That's too bad because this set has quite a few really nice images in it. I think it would also be nice if I took a gray white-core card stock and embossed it with a polka dot folder and then sanded it to expose the white core. I think I'll go try that now! Isn't it great when you come up with solutions using things you already have?!? LOVE how these came our!!! It's a real shame about the a Nigel policy cause someone would of scooped that beautiful card up in a second :( Great job though!!!! Hugs!